(SPOILERS) A film about black people made by white people for white people. 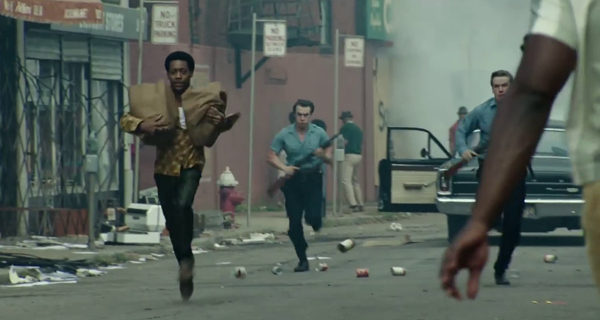 That’s the common charge levelled at Detroit, Kathryn Bigelow’s account of the 1967 Algier Motel incident. And it’s difficult to argue against the validity of the assertion. One might also add, “the majority of whom aren’t going to be interested in seeing it anyway, unless it gets some Oscar buzz, and even then”. Then, one might similarly doubt who Bigelow’s last few movies were for, exactly, since they seemed primarily designed to cement her status as a serious, politically-astute filmmaker who now shirks all that genre nonsense of her less socially-conscious days. More’s the pity. Is Detroit any good? It’s well made, as technically accomplished as everything she’s done, and electrically tense during its central section, but it isn’t so much an “angry” film (as some cheerleaders have suggested) as the result of a dispassionate craftsperson tackling combustive subject matter. It betrays exactly the eye of someone aware of the prestige status they now occupy. I wasn’t a fan of Zero Dark Thirty, a picture precision-designed to invade the consciousness as an official account – after all, we’re unlikely ever to get to see otherwise, any more than that elusively disposed of body – with all the dubious propaganda issues that entails (bring along just a smidge of controversy, to make it seem like you aren’t completely wagging your tail). The Hurt Locker was better, by virtue of still having its finger on the dramatics of the unabashed set piece, but it nevertheless didn’t warrant its Oscar glory, any more than K-19: The Widowmaker deserved to be dismissed out of hand, back before she was flavour of the month. 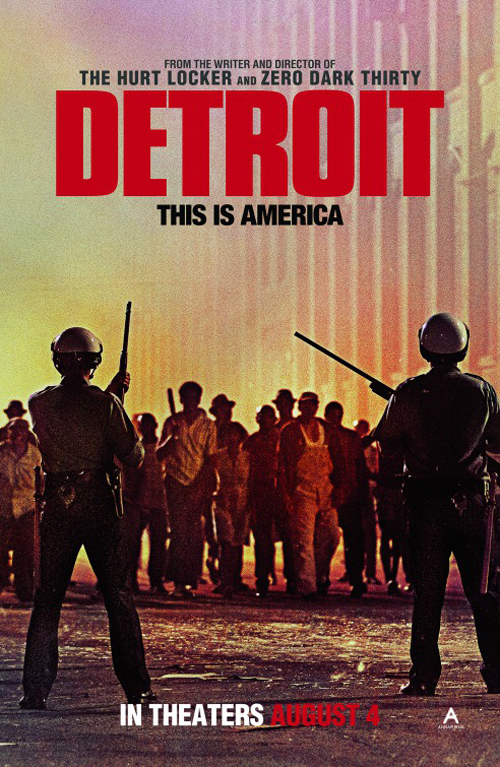 Detroit exhibits the casual virtuosity of a filmmaker who knows exactly what they’re doing technically – handheld camera that never becomes disorientating or distracting is used throughout, the sound design is inescapably oppressive – but it also betrays her “baser” instincts. Bigelow is a naturally kinetic director, her inclination is to excite her audience, and that’s both a boon to the incredibly taut proceedings that occur during the extended middle section of the picture, in the motel, and a drawback, because it highlights that’s all she’s really achieving, all she’s really adept at. There’s no outrage in her lens, merely calculation. Indeed, many a review has referred to Detroit as a horror movie. Is that really what this ought to be, though? “Punched up” in terms of tightening the screws of tension. Is that a suitable way to tell the story, if you feel the need to dramatise it? 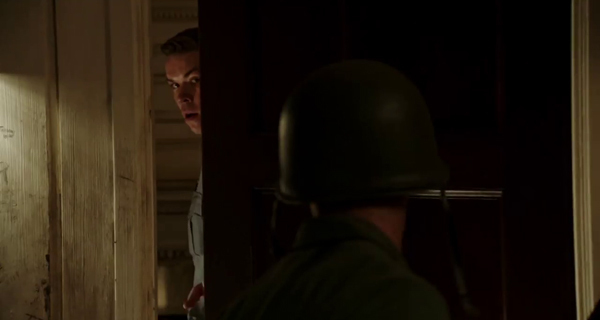 Is that the key to the casting of (the very good) Will Poulter, making the most of a naturally ghoulish visage to essay an unmitigated horror genre villain (aside from a wrong-footing line in his first scene, where refers to trying to a desire to “help these people”, moments before giving chase to a looter with a bag full of stolen groceries and shooting him in the back)? I guess it depends what you’re looking for from a picture. It’s very easy to push a button that elicits indignation when you’re working with the tools of an average home invasion thriller. What you expect more of is insight. There’s also the problem of Detroit as a story, though. If the meat is the mid-section in the Algiers, Bigelow has trouble with the rest of her sandwich. And problems with the focus on her protagonists too. The opening act seems to wander aimlessly at first, setting up incidents and encounters that coalesce into the characters we will follow into the motel (or, at least, some of them). That’s a smart strategy in eliciting empathy and attachment (or lack thereof in the case of Poulter’s Krauss and his accomplices; the picture is almost ineptly apologetic in showing other cops to be okay guys, such as the superior who labels Krauss a racist, or the patrolman who is beside himself with concern for the half-beaten-to-death Larry Reed). So why then is the instantly most engaging character one we don’t meet until we’re in the Motel, Anthony Mackie’s veteran Greene? 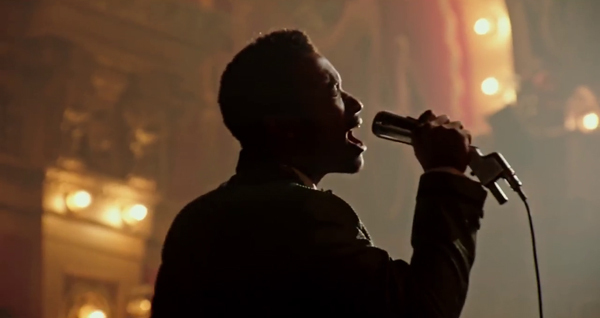 In particular, the focus on the arc of Reed (Algee Smith), no doubt because it represents most strikingly aspirations dashed and destroyed by that fateful night (he could have been the next big thing with The Dramatics, until it all went to hell) is weak and hackneyed, Mark Boal’s screenplay intent on using obvious melodramatic devices (Reed gets up on stage to deliver a few verses to an evacuated auditorium) to indicate this is the last occasion he’ll be doing such a thing. 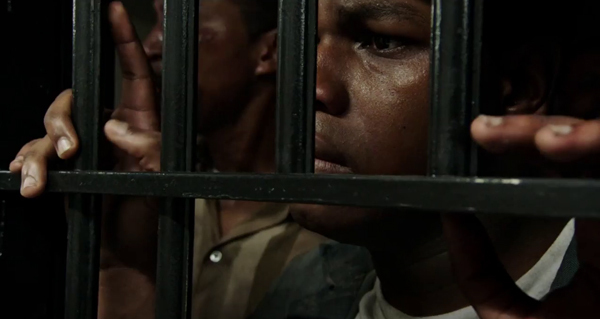 John Boyega is solid in an undernourished role as security guard Melvin Dismukes, attempting to tread a delicate line of peace-making and both self and general preservation (an account from at least one of the victims has Dismukes handing out beatings himself) but being particularly poorly served in the almost perfunctory trial-come-coda, even to the extent it isn’t immediately clear he is on trial (we see him arrested and then locked up, but then the attention shifts entirely to the bad cops). Also strong are the white girls (Hannah Murray of Game of Thrones and Kaitlyn Denver of Justified) whose mere presence inflames the cops’ wrath, Jason Mitchell (previously memorable as Easy-E in Straight Outta Compton) as Carl, whose foolhardy flourishing of a starter pistol initiates the convergence on the Motel, and Gbenga Akkinnagbe (The Wire) as the grieving father of one of the victims. The animated introduction concerning The Great Migration seems to float above the subsequent film, failing to inform or effectively contextualise the whole, as if it came after the fact in brainstorming how to position a picture relying on the tools of immediacy and the moment. 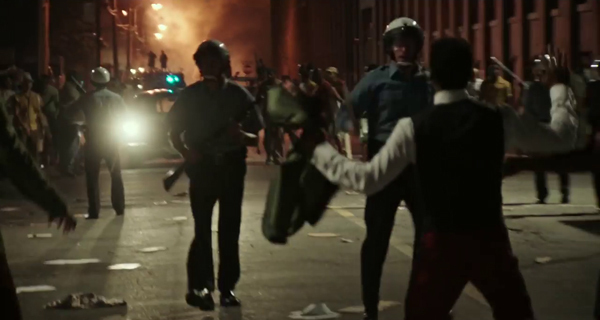 As a result, the riots appear to come out of nowhere, providing an excuse for only a lot of looting and abandon, with little grounding of the pervading political atmosphere. 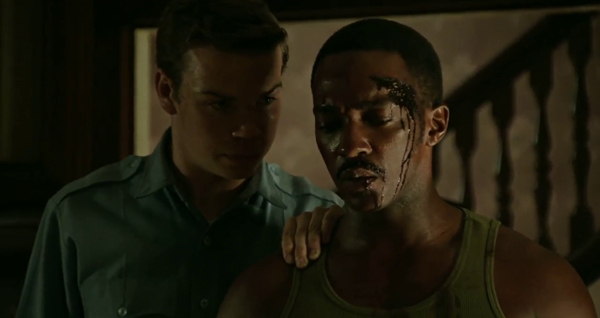 Boal and Bigelow know the part of the story they want to tell in Detroit, the part that’s a quick fix in dramatic terms, but they’re unable to get to grips with the bookends, which ought to have held equal weight – greater even – if they were to prove their best intentions.